Let’s cut to the chase – there have never been times as uncertain as these in the world of business. There is no written rule-book to follow when it comes to career survival. The “Future of Work” is about making ourselves employable in a workforce where the priority of business leaders is to invest in automation and digital technology, more than training and developing their own workforces. 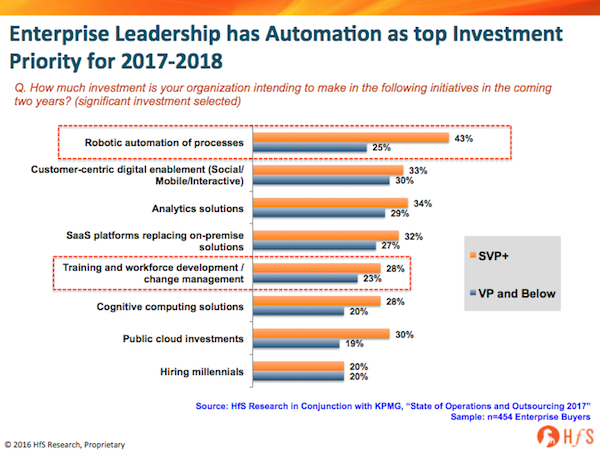 As our soon-to-be-released State of Operations and Outsourcing 2017 study, conducted in conjunction with KPMG across 454 major enterprise buyers globally, shows a dramatic shift in priorities from senior managers (SVPs and above), where 43% are earmarking significant investment in robotic automation of processes, compared with only 28% placing a similar emphasis on training and change management. In fact, the same number of senior managers are as focused on cognitive computing as their own people… yes, folks, this is the singularity of enterprise operations, where cognitive computing now equals employees’ brains when it comes to investment! 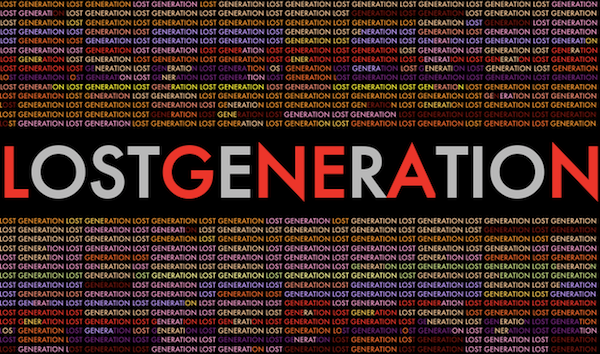 My deep-seated fear for today’s workforce is that we’re in danger of becoming this "Lost Generation" of workers if we persist in relying on what we already know, versus avoiding learning new skills that business leaders now need. We have to become students again, put our egos aside, and broaden our capabilities to avoid the quicksand of legacy executives no longer worth employing. We need to become hybrid corporate animals. Sales people: it’s no longer just about selling and relationship development, it’s about understanding evolving business models, understanding the impact of technology and the importance of smart marketing. You need to be a trusted consultant, not simply good with a 9-iron. Clients needs are increasingly complexifying and you need to be the arbiter of helping them simplify their requirements. Understanding business models is what will make you successful in the digital world. Software people: it’s no longer about data management, security and making apps function, it’s also about understanding the desired business outcomes associated with these investments and helping your enterprise stakeholders articulate them better, so you can work with them to fashion and build the right solutions. Design Think with your business colleagues, to make sure you are truly working in tandem to achieve the goals that you are setting for yourselves.... envisaging the desired outcomes and working backwards from there, is the smart way to do things with technology investments. Marketing people: forget spending all your time dredging up useless metrics to justify your existence, and focus more on learning new methods to drive awareness and new revenue, using all the evolving channels at your disposal. Really learn about the desired outcomes of your customers, prospects and your internal sales team to make sure you can be a true business partner to them and not a one-stop shop for them to check boxes. Marketing has to evolve into both a strategic and a tactical function that intelligently ties all the channels to market together. Finance people: this is less about churning out reports and data, but working with the key business stakeholders to understand the desired business outcomes of the organization and the evolving business models to produce relevant data and analysis. Simplification of data, as opposed to the production of it, is the watchword. Procurement people: this isn’t only about policing expenditure, but much more about understanding your enterprise stakeholders’ needs and desired outcomes to make sure you can help them access what they need to achieve them. You are a business-savvy relationship builder, not the guardian of the corporate coffers. You need to understand the whole sales, production, and marketing cycles of your organization if you really want to be a valuable asset. HR people: you need to make a significant shift away from being the guardians of your firm’s legal counsel, to a function that develops a genuine understanding of the business needs and the desired outcomes… as you will be tasked with finding the talent described above. Learn to identify talent with can learn on the job with an open mind, not simply finding “silver bullet” candidates who come locked and loaded with all the relevant experience. In the digital business world, the latter no longer exists. You need to be the football coach who unearths the rough diamonds with the potential your enterprise needs to achieve its outcomes. The Bottom-line: It’s one thing to describe the skills you need, but how do you go about developing them? 1. Which customers have you delighted recently? 2. What new relationships have you made that add value to our business? 3. What work have you done that excited people inside and outside of the business? 4. How are you helping energize your colleagues and exciting them with new ideas? 5. How have you helped add value to new business wins? 6. How have you contributed to new initiatives that improve productivity and effectiveness? Net-net, think of your firm as Walmart morphing into Amazon. Just a few short years ago, Walmart would judge its growth and success on how many new stores and how many new employees it created in a given year. Today, Amazon has completely disrupted Walmart’s business by focusing on how many new customers it acquired, without making any investments to its existing human or physical infrastructure. You need to be thinking like Amazon does… how can you be more valuable to your firm - without having to add heaps of staff to support you - by managing your time better; by reading (a lot) more; by making the effort to forge relationships with people who can make you smarter; by looking after your health better. Really liked the thoughts on how HR should focus on identifying talent which can learn on the job with open mind. Many a time we fall into the trap of selecting candidates based on whether they have done similar work in the past. A more thorough holistic analysis of a candidate's profile should help in identifying what the candidate can do in the future for the role if given an opportunity. Love it; however, there are going to be some outliers; Good to Great Organizations who are going to torpedo many organizations who think they can just simply buy technology, without investing in developing tight, small, fully bought in teams of technologists who optimize implementation of Cognitive Automation. My next article is going demonstrate why this is true and without which, things will go down hill even more quickly when trying to go fully autonomous. Phil, I cannot say strongly enough how you hit the nail on the head with this opening comment "...avoid the quicksand of legacy executives...". I will add this to it, who are focused exclusively on the next quarter's stock prices. There is no way they will be among the "Good to Great" companies and probably won't even survive the next round!. You may also take the opportunity to brush up the moniker of your Web site, we are no long in a "as-a-service" economy, If you read SaaS the other way, Service-as-a-Software, it seems to illustrate perfectly the underlying theme of digital transformations (transforming physical services into "software"). I believe we have entered the "as-a-Software" economy. APIs are the new business processes! @Jean-Jacque - the more we try to digitize processes and business models, the more we need smart people who can broaden their skills and learn how to manage bots/humans and articulate business requirements to software developpers. At some distant point in the future, we may be all about the software first, but I truly believe we're in a prople-first service economy for several years yet! I feel that this message is a wake up call and a new year gift!! Dear Phil - Any thoughts on should the Quality Assurance / Control function also re-discover itself in this era of RPA / Automation - where increasing number of services and processes are getting automated. Very insightful, Phil. Thank you for sharing. Connecting with the desired outcomes is absolutely key - however, we also see that those enterprise stakeholders or customers themselves do not necessarily know what those desired outcomes are (at a relevant level of detail & understanding that is meaningful to act from) - even when they do, those outcomes seem to morph quite frequently. Challenging times indeed but that only makes it even more interesting for all sides/parties to work in a very humble, inter-dependent & consultative mode. Wow! This is a real dose of reality. As companies morph from O2-breathing employees to digital do-it-alls, the new challenge will be managing the BOTs. Just as the shift from non-union to unionized, women in the workforce, etc. Automation needs governance and oversight, I think some companies miss this point. And, they miss the upside of re-training their humans and the value they bring.